Posted September 19, 2017 by Rob Keeling & filed under Headlines, Lists. Despite its numerous awards and accolades, it still feels like Father Ted can on occasion be somewhat underrated. 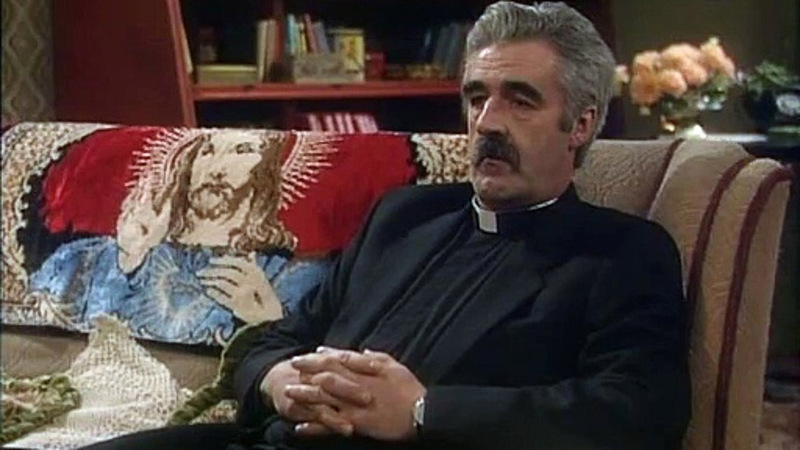 While many of its contemporaries get spoken of with greater reverence and accredited with far great cultural impact, Father Ted seems to slip under the radar slightly when discussion turns to all-time great sitcoms. It may follow a fairly straightforward structure, a group of oddballs live together and get into scrapes, but it was blessed with a perfect cast and ingenious scripts from Arthur Matthews and Graham Linehan. The duo combined a distinctly Irish sense of humour with moments of strange surrealism to deliver a show that was hilarious, witty and often unapologetically silly. The first series of the show had several strong episodes, including the chaotic ‘All Priests – Stars in Their Eyes Lookalike Competition’ in ‘Competition Time’ and the iconic blasphemous film protest in ‘The Passion of Saint Tibius’. The series highlight, however, came in the form of the brilliant ‘Entertaining Father Stone’. It’s a very simple premise for an episode, a painfully dull priest comes to visit and just won’t leave, but the increasingly frustrated atmosphere Father Stone’s presence generates in the parochial house is mined for tremendous comedic effect. Ted’s desperate attempts to get Father Stone out of the house so he can break the bad news to Father Jack is a particular highlight, but the episode’s crowning glory comes when Father Stone decides to use the bathroom while Ted reclines in the bath. It’s a moment of painfully awkward comedy at its very best. The first season was still a show finding its feet to some degree, but this gem demonstrated just how much potential lay in store.